Last year, I presented my mother with a bouquet of lily of the valley for Mother's Day. Her delight repaid the time and effort to pick and transport the flowers carefully, leading me to wonder how cultures perceived and interpreted them. The lily of the valley's cultural ascendency reveals that our fixation with colorful and large flowers does not always hold sway. From being the floral emblem of Ostara, the Norse goddess of the Dawn and Light to its bejeweled representation in the famed jeweler Karl Faberge's imperial Easter eggs, the lily of the valley has symbolized different European and religious imagery. Its elegance especially captured the fancy of the French. 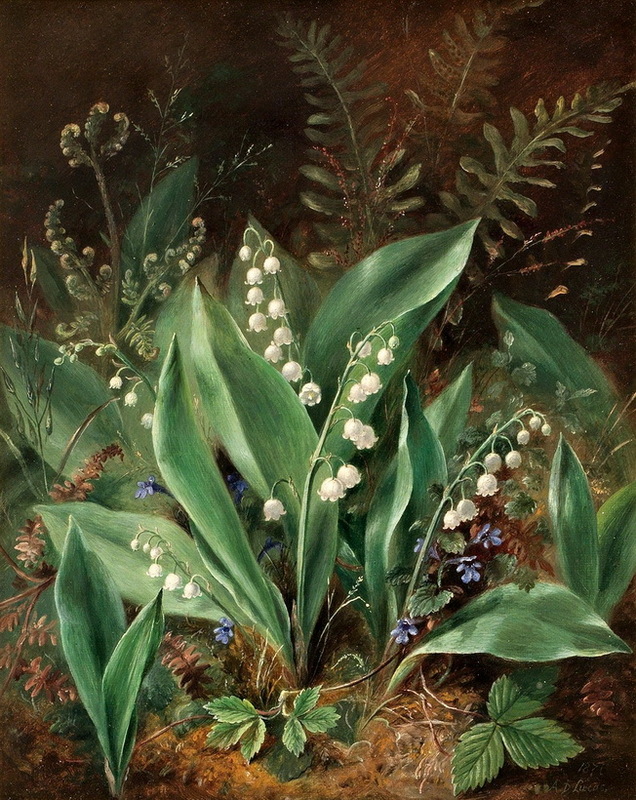 The French celebrate La Fête du Muguet, a tradition that began when the King Charles of France - only ten at the time- was given a bouquet of lily of the valley on May 1st of 1851 and inspired by the floral gesture of luck and prosperity, started to present the ladies of his court with small bunches on the same day. Today small bunches of lily of the valley still are sold each year on May Day. The flower's hypnotic scent has inspired perfumers, especially French ones, to distill it in hopes of prolonging what seems an unmercifully brief seasonal pleasure. Diorissimo, the fragrance that Edmond Roudnitska created for Christian Dior in 1955, is perhaps the most famous distillation of the lily of the valley. Dior himself was enamored with this flower, it as the sign of his couture business and even sewed flowering sprigs in the dresses' hems (the scent would trail the models' sashaying down the catwalk). He transposed the lily of the valley as a floral motif in his dresses as well. Pierre-François-Pascal Guerlain was another French couturier taken with the lily of the valley, creating a fragrance in 1840, and the house of Guerlain continues to produce it in limited quantities since 2005. Sadly, like some desirable scented flowers, the lily-of-the-valley has resisted the efforts of the perfumery science to capture its essence and what passes as the lily-of-the-valley in cosmetics is a synthetic product. The lily of the valley's simple beauty and the arching lines beloved by artisans and craftsmen working in the style of Art Nouveau, saw it cast in glass, jewels and metals. In one of Faberge's imperial East eggs, the lily of the valley drape the pedestal, snaking upwards around the surface. On a crystal bottle, Rene Lalique reworked the flowers as spraying forth from the neck as if their scent was being dispensed. Inspired by the lily of the valley's serpentine lines, the German ceramic firm Villeroy & Boch moulded the flowers fanning out from the center of a glazed earthenware plate. Modern fashion designers have not overlooked the lure of the lily of the valley. Taking their cue from Dior, the Italian designers Dolce & Gabbana designed a lily of the valley dress for the Spring 2013 collection. Taking liberties with botanical accuracy, the designers depict the flowers open-faced and multi-clustered like those of Myosotis (forget-me-not) or Ixia and leaves broad dabs of green, all made striking transposed against the black satiny fabric. Several female celebrities were clearly beckoned to don the dress in all its iterations. Audrey Hepburn had the clear sense to let the genuine article speak for themselves, gracing her gamine, but beautiful features with a lavish lily of the valley bouquet. Dressed simply in a bridal gown, she saw little need for adornment except for simple pearl earrings. Hepburn understood the qualities that made lily of the valley Dior's favorite flower, and the pleasure the bouquet it likely gave her was the same that made my mother smile on Mother's Day.